Iraq before the 1991 Gulf War was a modern despotism with a shiny infrastructure financed by one of the most profitable oil industries in the Middle East. The government provided medical care for the poor; an expanding education system had slashed illiteracy. Life was comfortable for the big, secular-minded middle class—the English-speaking doctors and engineers with their diverse portfolio of investments: property, cars, carpets. The housewives bought filet because it was cheap to buy chuck, fruits were consumed by the crate-load, and child obesity was a national problem. There is more than a passing similarity between the Iraq of 1990 and Iran now—or, rather, the Iran of a year or so ago, before sanctions started to bite. More than a decade of high oil prices had made the country considerably richer even than Iraq in 1990. The middle class splurged on food and consumer goods and the poor were guarded from penury by government handouts. The Islamic Republic earned $166 billion in foreign exchange in 2011 alone, mostly from oil exports of 2.5 million barrels per day. Its leaders were able to laugh off the effects of American, European Union and United Nations sanctions—“scraps of paper,” in the words of President Mahmoud Ahmadinejad. The same leaders now admit that sanctions are having an effect; the supreme leader, Ayatollah Ali Khamenei, has called them “savage.” Oil production has dropped sharply for want of buyers and this year, according to the IMF, the economy is expected to shrink for the first time in two decades. In the autumn, the rial lost almost half its value against the dollar on fears that the government is unwilling or unable to prop it up. Inflation is thought to be running at well over the official rate of 25 percent; unemployment is also rising as consumer spending falls and import-dependent businesses go to the wall. A cloud of pessimism has settled over Iran, with unaffordable rents, empty butchers’ shops and everybody scrounging money off the next man. The brash, frenetically consumerist Tehran that I had grown accustomed to in recent years has disappeared. To be sure, Iran is not yet in the condition of post-Gulf War Iraq. The country is still finding buyers for a lot of oil, and the IMF predicts that the economy will return to modest growth in 2013. The various sets of sanctions are far from being a comprehensive blockade. But nor are those sanctions as “smart” as America and its allies like to insist. Yes, Iran is at liberty to purchase food, medicine and humanitarian items. But cutting Iran off from the international banking system is a sure way of denying people access to foreign commodities, as is deliberately bringing about the collapse of the rial. Already, there are signs of a humanitarian crisis. 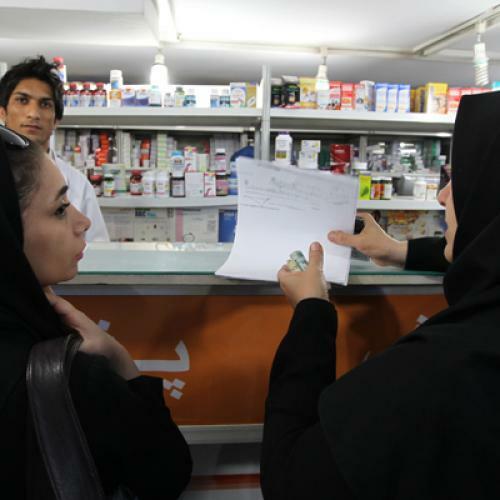 According to the New York Times, one of the last western media outlets with a resident correspondent in Tehran, Iranians suffering from cancer, haemophilia, thalassemia and kidney problems are finding it increasingly hard to get the foreign-made medicines they need. A charity chief quoted by the paper said that hospital machines are breaking down from a lack of spare parts and that pharmaceutical companies are running out of imported raw materials. Indeed, the Obama administration presents the sanctions regime a triumph of U.S.-led multilateralism—a coalition of countries adroitly marshalled into action against a rogue state which has refused to subject its nuclear complex to proper scrutiny or constraints. A consensus has emerged that the sanctions against Iran are an exemplary instance of foreign policy. They are supported by the peace lobby because they seem preferable to war, as well as by the hawks, who regard them as an overture to war. The assumption is that the more Iranians suffer, the more their leaders will feel the pressure and either change course or be overthrown in a popular uprising. And yet, there is no evidence to suggest that this is probable, and the Iraqi case suggests the opposite. During the U.N. blockade, Saddam was able to blame foreigners for the nation’s suffering, and ordinary Iraqis—those who might have been expected to show discontent at his misrule—grew more and more dependent on the rations he distributed. Furthermore, America’s insistence that an end to sanctions was conditional on Saddam’s departure removed any incentive he might have had to cooperate with U.N. weapons inspectors. In 1997, he stopped doing so, with the results we all know. Khamenei and those around him believe that sanctions policy is part of a bigger American project of Iraq-style regime change. There is some logic to this; recent western tactics against Iran include sabotage, assassination and diplomatic isolation—hardly indicative of a desire for detente. The most recent round of nuclear negotiations foundered, in part, on Iran’s growing conviction that the U.S. will make no significant concession on sanctions unless Iran drastically scales down its program of uranium enrichment. That seems unlikely to happen–not simply for reasons of image and prestige, but because, as American hostility sharpens, Iran may judge its nuclear program to be the best defense it has against the fate that befell Saddam. Washington has been pushing against an Israeli attack and insisting that sanctions must be given “time to work”. Unless the U.S. much more effectively shows that sanctions will be lightened substantially in return for confidence-building measures on Iran’s part, the danger is that sanctions will have ceased to serve as an instrument of policy, and simply become the policy itself. They increasingly seem little more than an attempt to strike a domestic compromise between doves and hawks—a compromise destined to fail to achieve its stated international aims, while destroying Iran in the bargain. The current course bucks the hopeful trend seen during most of the first Obama term, when America adopted a sensible, hands-off approach to most of the Middle East, thus contributing to the revolutions of 2011. The irony is that, compared to most Middle Easterners, ordinary Iranians are pro-American. Sanctions threaten not only to deny these people their health, education and hope for the future, but also to feed new grievances against the United States. It happened in Iraq, as we discovered after 2003. Hasn’t that lesson been learned? Christopher de Bellaigue’s latest book is Patriot of Persia: Muhammad Mossadegh and a Tragic Anglo-American Coup.